Punk took control of me right away with a headlock. I was barely able to squirm out before looking in a arm lock from behind. Punk transferred it into a wrist lock. I rolled out of it and kicked him in the gut, but he grabbed my foot. I enzugiried him. I ran forward, but Punk backed into the corner quickly. I smirked at him as he had a new focus in his eyes. "You think Punk might have underestimated Gabby?" Michael asked. "I think he defiantly did, Gabby is one tough chick," JBL said with a chuckle as we circled again. "Not as easy as you thought?" I yelled at him. Punk dove forward without answered, but I ducked under and locked in a sleeper from behind. Punk backed into the corner as quick as possible, causing me to let go. I kicked Punk in the back causing him to stumble forward before getting on the top rope and hitting him with a neckbreaker from the top rope. I super kicked him in the face before he could even react. "Ok," Punk muttered getting up. "Not as easy as it looks, is it Punk!" Seth yelled from ringside. It was about twenty minutes later. I couldn&apos;t believe how long I had lasted. Doing your homework pays off. I grabbed onto the ropes as I tried to get to my feet. Punk had just gotten to his. As soon as I stood up, Punk hit me with a knee and clotheslined me before going to the top rope. I didn&apos;t move out of the way quick enough as he hit me with a diving elbow. I barely kicked out at two. 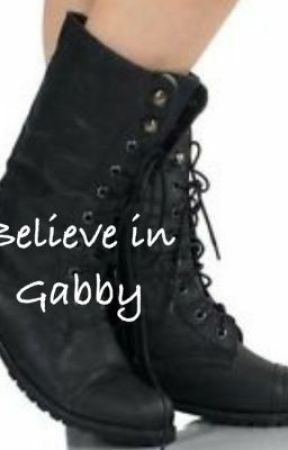 "Gabby just won&apos;t give up!" Michael exclaimed as I held my chest. "Come on, Gabs!" I heard Dean yell from ringside. Punk grabbed me from behind and put me on his shoulders. I grabbed onto the ropes and held on for dear life. Dean got on the apron to distract the ref. Seth came from behind and yanked me off before sliding out of the ring. Punk didn&apos;t take it and went after Seth. I got to my feet and spotted Seth running around the ring. I slid out and let Seth pass me before slamming Punk in the face with kick. "Did you hear that?" JBL said as the crowd oohed. I tried to catch my breath as I slid I the ring and watched Punk, begging him to stay out of the ring and let me get away with a count out. "8!" The ref yelled as Punk grabbed the apron and started pulling himself to his feet. I cried out in frustration when Punk got in at the last moment. I took a deep breath, trying to calm myself down. I ran over and started hitting Punk with kick after kick to his ribs. The ref backed me up when Punk grabbed onto the ropes. I ran over and nailed Punk with another super kick before walking to the turnbuckle and slowly climbed up. Punk was on the ground so I turned around and jumped, going for a moonsault. I gasped in shock when Punk caught me in midair. I tried getting away, but Punk threw me up, slamming his knee into my face. The ref counted to three. Right after the count the guys ran in and surrounded Punk. I slowly got up and saw that I was blocking Punks way to the ramp. Punk turned towards me.